26. Johann Georg SCHMID was born on 6 May 1821 in Wuerttemberg, Germany. Johann was baptized on 6 May 1821 at the Katholisch, Haisterkirch, Donaukreis, Wuerttemberg, Germany. He came to the USA in 1854. On October 19, 1860 at the Circuit Court of Cook County, Chicago, Illinois, he fulfilled the requirements of naturalization and renounced his allegiance to William I King of Wurtemberg. (View Document). As a carpenter, he built the first school house in Cary, which later became the Methodist church. It was located where Flagg Funeral home is now on High Road. He died on 18 Apr 1910 in Cary, McHenry, Illinois. 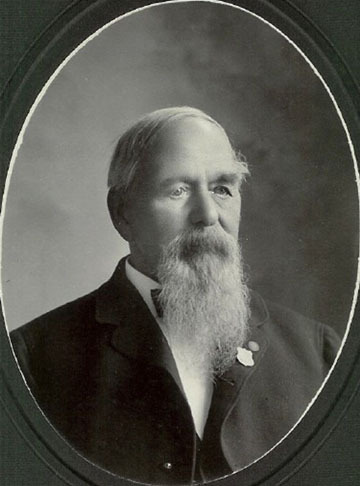 Cary has once more been called upon to sacrifice another of its oldest and most respected citizens and veterans of the Civil War in the death of John George Smith, which occurred at his old home early last Monday morning, April 18, 1910, at the ripe old age of nearly 89 years. He was familiarly known by the old-timers as "Uncle George". He was born in Wurtemburg, Germany, May 6, 1821. When he arrived at the military age, which is compulsory in Germany, he was attached to the cavalry branch of service, where he served 12 years in the garrisoned city of ULM, after which he followed his trade, that of carpenter and builder, and also music, which he continued after arriving in this country. Everyone in McHenry county knows how he was devoted to and loved music, and he was a very capable performer on the cornet and trombone. This he clearly demonstrated by organizing and instructing the old Algonquin Citizen's band and later the Cary Brass band. The deceased came to the United States in 1854, in a sailing vessel, accompanied by his wife and two children. The voyage was a tempestuous one, lasting 27 days. He came direct to Chicago, where he resided three years, coming to Cary in 1857, where he has resided continuously ever since up to the time of his death April 18, 1910. He was on the point of moving to New Ulm, Minn., in 1862, when he learned of the great Indian uprising and massacre of the whites, and instead, volunteered his services and enlisted for the Union at Camp Fuller, Rockford, Ill. in Co. I, 95th Regiment Illinois Infantry. He served his country from August, 1862, until he was honorably discharged in August, 1865. He participated in the siege of Vicksburg and other important engagements. He was a member of Nunda Post G.A.R. and always enjoyed a healthy and vigorous life up to within a few days previous to his death, which was unexpected. He sometimes complained of severe attacks of rheumatism, which he contracted during the war. On the first of April he caught a severe cold, which developed into the grip, and at his advanced age it proved too much for the "grim old warrior." Sunday evening he chatted pleasantly with his two sons and daughter and then sank into a peaceful sleep, and between 4 and 5 o'clock Monday morning it was discovered that he was dead. The funeral services were held on Wednesday following his death, at 1 p.m. from the house and at 1:30 from the M.E. Church, services being conducted by Rev. C. D. King and Rev. W. A. Cross. They were attended by a large concourse of old time friends and neighbors, many being present from Chicago, Algonquin, Crystal Lake, Dundee, Barrington, Woodstock and elsewhere. The body was tenderly laid to rest in the Cary cemetery, beside that of his first wife, who died in 1889. He leaves three sons - Gottlieb of New Ulm, Minn.; Albert H. of Bloomington and George E. of Chicago - and one daughter, Mrs. John J. Smith of Cary, besides a large number of grandchildren and great grandchildren. At the grave the services were conducted by the beautiful ritualistic rites of the G.A.R. He was a loyal patriot and life long Republican. It had been his custom on every New Year and Memorial day to give the bugle calls so appropriate for the occasions, but he has made the last call and answered the final summons. He was laid to rest in a grave beautifully decorated with bunting, evergreens, carnations and the American flag, the casket being covered by Old Glory, and a large American flag covering the earth at the grave. Beautiful floral tributes, of which he was very fond, given by loved ones, relatives and friends alike, were in evidence. Those from a distance attending the funeral were: Mrs. John Miller, and son, John August Miller, Mrs. Lizzie Einbecker, Teufel Jacob Kastler, Chicago; Mr. and Mrs. August Eggler, Dundee; S. L. Eella, Elgin; Arthur Smith, Mrs. Weidrich, Mrs. Hough, Mr. and Mrs. Snyder, Woodstock. He was married to Barbara Weyher LANGE on 6 May 1848. 27. Barbara Weyher LANGE was born on 17 Jul 1820 in Germany. She died on 4 Mar 1889 in Cary, McHenry, Illinois. 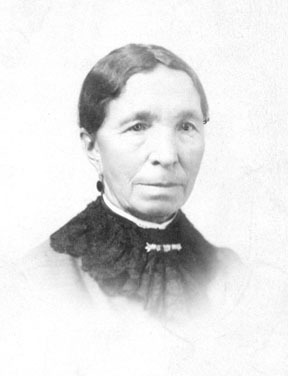 After an illness of four months duration accompanied by a great amount of suffering, Mrs Barbara Smith, wife of J G Smith, departed this life at 11:20 A M, on Monday last, March fourth, 1889, at the age of 68 years, 7 months and 14 days. Her husband and four children survive her. During the first part of her sickness she expressed a desire to live at least two years longer, but towards the last was ready and anxious to go, as she said she was but trouble to others and could do no one any good. She was generally loved and respected by all who knew her. She was a devout member of the German Lutheran church. The deceased was a native of Germany and came to this country in 1854, and to Cary in March 1857, having resided here ever since. The funeral services were held Wednesday afternoon at two o'clock, at the FM church, and the remains were carefully interred in our Cemetery. She was buried in Cary, McHenry, Illinois. John G. Schmid's home in Cary, Illinois. On the porch with him is his daughter, Barbara and perhaps either his grandson Arthur or John. i. Lisette SCHMID was born on 25 Jan 1845. She died on 18 Apr 1846.
iii. Louise SCHMID was born on 29 Dec 1849. She died on 4 Dec 1857.
iv. Karl SCHMID was born on 12 May 1851. He was baptized on 15 Aug 1852.
v. Karl Heinrich SCHMID was born on 10 Sep 1852. He died on 13 May 1853.
vi. 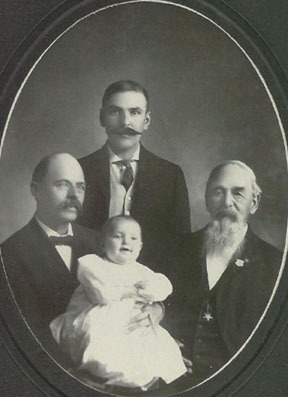 Lisette Josephine Katharine SCHMID was born on 15 Jun 1853. She died on 27 Aug 1854.
vii. Louis SCHMID was born on 25 Aug 1854. He died on 10 Jan 1855.
viii. Louis SCHMID was born on 13 Nov 1855. 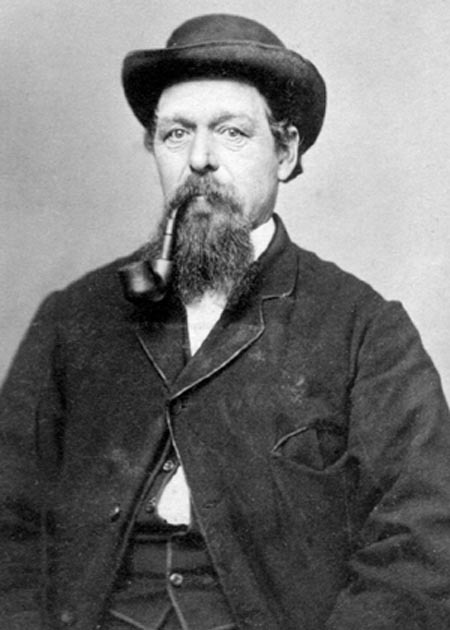 He died on 3 Dec 1857.
x. George E. SMITH was born on 12 Nov 1860 in Cary, McHenry, Illinois.. He married Anna A. TOMISKY of Cary on March 25, 1889 at the bride's home. It was reported to be a quiet wedding as George's mother had died just three weeks prior. Anna died in March, 1909 from complications following surgery. She was buried in her family's plot in Algonquin Cemetery. Her obituary appeared in the Crystal Lake Herald, April 22, 1909... Mrs. Anna Smith, beloved wife of George E. Smith of Chicago, and eldest daughter of Mrs. Catharine Tomisky, died at her former home in Cary on Wednesday morning, March 24, 1909, aged 44 years. Her death followed an operation she underwent on the Saturday previous, for the removal of a tumor. From a surgical point of view it was very successfully performed, but owing to her weakened condition she could not withstand the shock, although high hopes had been entertained for her recovery up to the morning of her death, when she suddenly collapsed and failed to respond to the treatment administered, and it was soon evident that the end was near. All that the combined skill of five doctors and two trained nurses could render was of no avail, and she sank into a peaceful slumber that knows no awakening. Besides her mother and husband, left to mourn her untimely departure, were three brothers and three sisters, and a very large number of relatives and friends, by whom she was universally loved and esteemed. The funeral services were conducted at the residence on Friday morning, at 11 o�clock, interment being in the Algonquin cemetery. The Rev. Herman Brandt, of the Episcopal church of Harvard, Ill., officiated. Her favorite hymns, �Lead, Kindly Light� and �Nearer My God To Thee,� were sung by Rev. 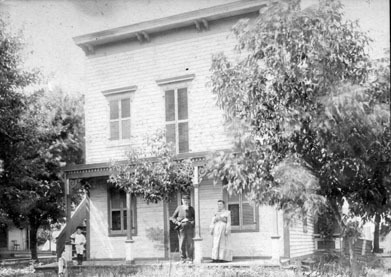 C. D. King and wife. The pall-bearers were all cousins of the deceased, and the floral offerings were beautiful. The clergyman paid a most beautiful tribute to the many kind and gentle traits of character of the deceased. Her�s was one worthy to be copied by those she left behind. She will be greatly missed. One only hope can comfort the many relatives in this the sad hour of their bereavement--the hope that somewhere in our Father�s mansion, where her spirit has taken up its abode, she looks down upon and loves us still. The shadows of the valley of death cannot eclipse the light of our love for her, and may the hope of a blessed reunion be our hope and comfort and stay. George was a pharmacist on Hamlin Avenue in Chicago. He died 10 January 1939 in Chicago, Cook, Illinois after being hit by a taxicab. xi. Albert Heinrick SMITH was born on 24 Dec 1862. He died 1 Mar 1929 in Chicago, Cook, Illinois. 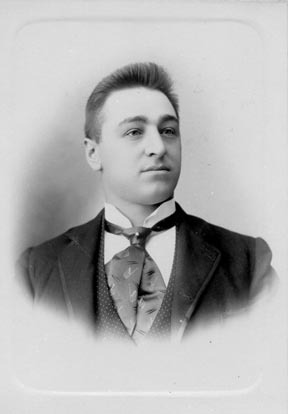 After his first wife's death, John George Schmidt was married to Magdalena (Weidrich) Snyder on July 20, 1891, (as noted on the marriage license). Obituary in The Crystal Lake Herald, July 15, 1909: Magdalena Weidrich was born at Alsace, Germany, Sept. 23, 1833. She came to this country with her parents when 12 years of age, and located on a farm on Queen Anne prairie, north of Woodstock. She was married to Peter Snyder, at Woodstock, about 1854. Mr. Snyder died in 1883, and on July 17, 1891, she was married to J. G. Schmidt of Cary, where she had resided ever since. She died at her home in Cary after a brief illness on Wednesday, July 7. She was a faithful member of the M. E. church and a great worker for the promotion of its interests, and will be greatly missed in the community, being a kind neighbor and friend to all in distress. Funeral services were held Friday, at 8:30 a. m., from the house, and at 10 o'clock from the German church at Woodstock, Rev. C. D. King officiating, and interment took place in the Queen Anne cemetery north of Woodstock.